A majority of Americans say race relations are generally bad, and many think the country hasn’t made enough progress toward racial equality. A new Pew Research Center reportfinds deep divides between white and black adults – and between Republicans and Democrats – in views about race relations and racial inequality in the United States. Blacks are particularly gloomy: About seven-in-ten say race relations are bad, and half say it is unlikely that black people will eventually have equal rights with whites. Here are other key findings from the survey, which was conducted in English and Spanish among 6,637 adults, Jan. 22-Feb. 5, 2019. 1 A plurality of Americans (45%) say the country hasn’t gone far enough in giving black people equal rights with whites, while 39% say it’s been about right and 15% say we’ve gone too far. Black adults are by far the most likely to say the country hasn’t gone far enough – 78% say this, compared with 37% of whites and 48% of Hispanics. Among whites, there is a vast party divide on this issue. While 64% of white Democrats and Democratic-leaning independents say the country hasn’t gone far enough in giving blacks equal rights with whites, only 15% of Republicans and Republican leaners say the same. About a third of white Republicans (31%) say the country has gone too far, compared with 5% of white Democrats. 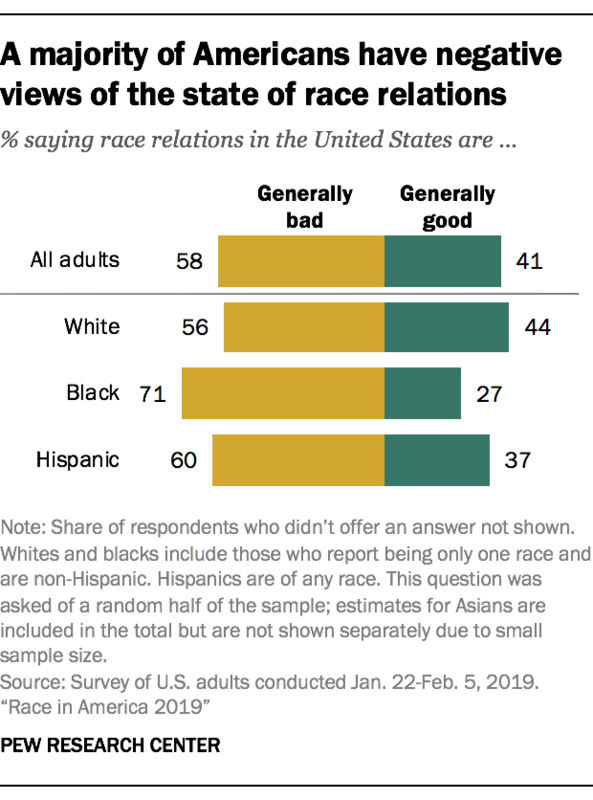 2 Majorities of whites, blacks and Hispanics say race relations are bad, and many say they’re getting worse.Over half of U.S. adults (58%) say race relations are generally bad, and while this share is highest among blacks, majorities of whites and Hispanics also say this. Overall, 53% of the public says race relations are getting worse, while 17% say they are getting better and 30% say they’re staying the same. Those who say race relations are generally bad are particularly pessimistic – 69% of that group says race relations are getting worse, compared with 30% of those who say race relations are generally good. A majority of Americans (56%) say President Donald Trump has made race relations worse. Meanwhile, 15% say he has made progress toward improving race relations, 13% say he has tried but failed to make progress and 14% say he has not addressed the issue. Most blacks, Hispanics and Asians say Trump has made race relations worse, while about half of whites (49%) say the same. 4 About six-in-ten adults (59%) say being white helps a person’s ability to get ahead in our country these days. Meanwhile, about half or more say being black or Hispanic puts people at a disadvantage. The public is more divided over the impact of being Asian or Native American on a person’s ability to get ahead. While a majority of whites say that being white helps at least a little, blacks, Hispanics and Asians are even more likely to say this. Among whites, those who are more educated, as well as Democrats, are the most likely to say there are advantages to being white. When asked how their race has impacted their own ability to get ahead, about half of black adults (52%) say being black has hurt at least a little. About a quarter of Hispanics and Asians (24% each) and just 5% of whites say their race or ethnicity has hurt their ability to get ahead. Whites are the most likely to say their race has helped them (45%). 5Blacks and whites offer different reasons for why black people may have a harder time getting ahead than white people. Among those who say being black hurts a person’s ability to get ahead, blacks are much more likely than whites (84% vs. 54%) to say that racial discrimination is a major reason for this. Blacks are also more likely to say that less access to high-paying jobs and good schools are major obstacles for black people. Whites, in turn, are more likely than blacks to say that family instability and a lack of good role models are major reasons why it may be harder for black people to get ahead; black and white adults who say being black hurts a person’s ability to get ahead are equally likely to say a lack of motivation to work hard is a major reason (22% of each say this). 6 Seven-in-ten Americans say it’s never acceptable for a white person to use the N-word. Whites and blacks have similar views on this issue – 72% of whites and 71% of blacks say they personally think it’s never acceptable. Hispanics are somewhat less likely to say a white person using the N-word is never acceptable (58%), but this is driven in part by a relatively large share of foreign-born Hispanics (28%) who say they aren’t sure whether this is acceptable. Among Hispanics born in the U.S., 67% say it is never acceptable. When it comes to whether it’s acceptable for a black person to use the N-word, about four-in-ten adults (38%) say they personally find it never acceptable. This includes similar shares of whites and blacks. 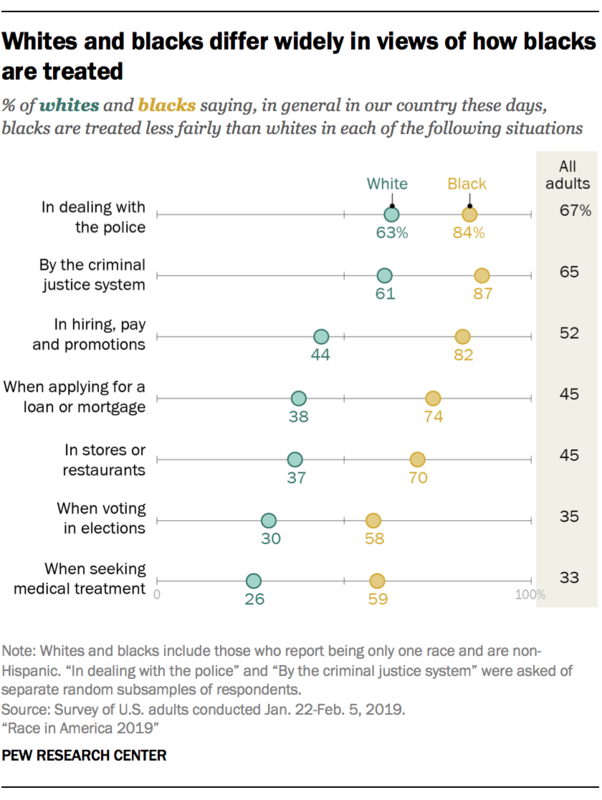 7 Majorities of white and black adults say blacks are treated less fairly than whites by the criminal justice system and in dealing with the police,but blacks are significantly more likely to say this. About six-in-ten black adults or more, compared with fewer than half of whites, say that blacks are treated less fairly than whites in hiring, pay and promotions; when applying for a loan or mortgage; in stores or restaurants; when voting in elections; and when seeking medical treatment. Among whites, gaps between Democrats and Republicans on whether blacks are treated less fairly than whites in various situations range from 39 to 53 percentage points. For example, while nearly all white Democrats (88%) say blacks are treated less fairly than whites in dealing with the police, 43% of white Republicans say the same. And very few white Republicans (7%) say blacks are treated less fairly when voting in elections, while a majority of white Democrats (60%) say the same. 8About three-quarters of black adults say being black is very or extremely important to how they think about themselves; 15% of whites say the same about being white. Blacks are the most likely to say their race is extremely or very important to their sense of identity; 59% of Hispanics and 54% of Asians say the same about being Hispanic or Asian. In contrast, about two-thirds of whites say being white is only a little important (18%) or not important at all (47%) to how they think about themselves. Among both blacks and whites, those younger than 30 are less likely to place importance on their race as part of their overall identity. 9Majorities of blacks, Hispanics and Asians say they have faced discrimination or unfair treatment because of their race or ethnicity. About three-quarters of blacks (76%) and Asians (75%), as well as 58% of Hispanics, say that they have experienced discrimination or been treated unfairly regularly or from time to time. Most whites (67%) say they have never experienced this. When asked about specific situations they may have experienced because of their race or ethnicity, blacks are much more likely than other racial and ethnic groups to report that people have acted as if they were suspicious of them or as if they thought they weren’t smart; that employers have treated them unfairly in hiring, pay or promotion; and that they have been unfairly stopped by police. Meanwhile, whites are the most likely to say that people have assumed they were racist or prejudiced because of their race or ethnicity, while Asians are more likely than other groups to say they have been subject to slurs and jokes. Anna Brown is a research analyst focusing on social and demographic trends at Pew Research. Previous articleThe Notre Dame fire is out!